Welcome to North Lake School’s Third and Fourth Grades. North Lake School’s curriculum is aligned with the Common Core State Standards in English Language Arts & Literacy and Mathematics. 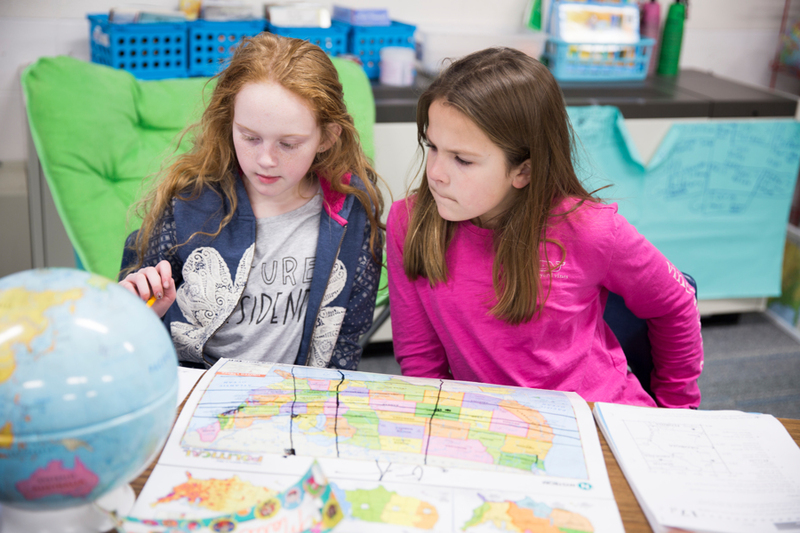 Science, social studies, and specialized classes are guided by the Wisconsin Academic Standards. The overall instructional program is balanced and integrated through thematic grade-level units. The goal is to provide enriching experiences through learning activities that support our school mission. Students are actively involved in the teaching and learning process as they discover new knowledge, develop positive attitudes, and communicate effectively with our school community. Grades 3 and 4 have core classes which are taught by two teachers specializing in literacy/social studies or math/science. All content subjects are integrated across the curriculum. The academic program in 4K-4th grade is held to high standards and focuses on the acquisition of independent work habits, personal responsibility, and relevant learning. North Lake School’s third and fourth grade language arts curriculum is derived from the Houghton Mifflin Harcourt JOURNEYS 2014 program. Journeys is a K–6 reading program that provides a balanced approach to literacy instruction. Journeys digs deeper into complex text and engages students in classroom discussions about essential questions. Journeys differentiates to meet all learners’ needs, provides multiple opportunities for learning, and personalizes intervention for specific readers. Journeys raises the bar with apps, Interactive Whiteboard Lessons, eTextbooks, online student and teacher collaboration, & research and assessment. For specific grade learning targets, please contact your child’s teacher. Math Expressions (Houghton Mifflin Harcourt) is our math curriculum for third and fourth grade. Math Expressions combines the most powerful elements of standards based instruction with the best of traditional approaches. Math Expressions uses objects, drawings, conceptual language, and real world situations to help students build mathematical ideas that make sense to them. Third and Fourth graders have a blast with many hands-on science experiments and engineering quests. Multiple resources and texts are employed in the classrooms. Engineering is Elementary units extend and enhance the curriculum. Students become familiar with the scientific method and engineering design process. -Builds a solid foundation of essential social studies skills and concepts. -Develops responsible citizens-in the community, country, and world. -Develops multicultural awareness and sensitivity. -Reinforces reading, writing, math, and science. -Integrates frequent assessment and evaluation. -Stimulates a variety of intelligences. -Provides learning opportunities for diverse student populations. -Ensures success for all students. Mapping and Exploring Communities, the United States, and the World. Exploring various maps such as Political, Physical, and Thematic. Exploring the Globe and learning how to use Grid Systems. Exploring the Eight Regions of the United States. The Wisconsin Journey is our primary resource for reading and reference in fourth grade social studies. Themes and topics are integrated with our language arts curriculum throughout the year. There are some very special projects that enhance student learning as well. Grade 4 enjoys a one-week One Room Schoolhouse Simulation and completes a personalized Heritage Project.